Event takes a look at venues for hire at family attractions across the UK. This year, Butlin's is celebrating its 80th anniversary. The seaside resorts, based in Bognor Regis, Minehead and Skegness, offer a range of flexible spaces, from 10-seat board rooms to the exclusive hire of an entire resort, hosting events for up to 7,000 people. In February, Butlin's launched a collection of M3 air domes across its resorts, suited to hosting a wide range of events including breakouts and drink receptions, both indoor and outdoor. A range of connecting tunnels are also available to add. The Staffordshire- based theme park this year launched its Ride before you Dine package, offering the chance to ride Galactica, the world's first rollercoaster with fully-integrated virtual reality, multiple times without queuing. This is followed by the chance to host a dinner at he Rollercoaster Restaurant, where dishes travel along spiraling rollercoaster track and loop-the-loops before landing at their tables. Last year, Alton Towers also introduced 120 woodland lodges and five luxury treehouses to its Enchanted Village area, with the added option to exclusively hire the entire village, accommodating up to 520 delegates for events. 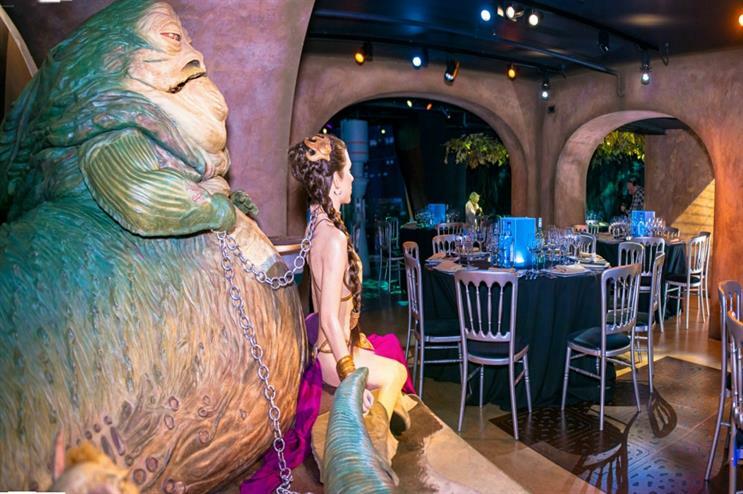 A new movie-themed event space was unveiled in May at Madame Tussauds in London. Movies at Madame Tussauds can accommodate up to 80 guests for seated dinners and 120 for standing events. The space aims to celebrate some of the most memorable characters in sci-fi history and offers an immersive element to Madame Tussauds' event offering. Guests can start with cocktails in the Marvel Movie Zone, before moving on to a high octane 4D cinematic experience, and end the evening amongst the likes of Luke Skywalker and Darth Vader in the Star Wars experience. Covent Garden-based ondon Film Museum, which is hosting a Bond in Motion exhibition, the largest official collection of original James Bond vehicles, offers space for events that can be separated into five different areas for day and evening events, for between 20 to 300 guests. These areas are suited to awards, meetings, receptions and dinners.